Metro Wholesale Myanmar secures USm loan from the International Finance Corporation. Metro Wholesale Myanmar Limited (“Metro Wholesale Myanmar”) a Myanmar joint-venture company owned by Frankfurt-listed Metro AG (85%) and Singapore-listed Yoma Strategic Holdings Limited (15%) has secured a US$20m loan from the International Finance Corporation (“IFC”), the investment arm of the World Bank. Metro Wholesale Myanmar offers one-stop wholesale food service distribution for hotels, restaurants, retailers, and offices. According to the IFC, the financing will have a positive effect on agricultural incomes and improve the quality and availability of local produce, benefiting buyers and end consumers. The terms of the loan have not been disclosed. The IFC said the investment will allow Metro Wholesale Myanmar source the majority of its produce from local farmers and companies, raising food safety standards and creating employment opportunities in food processing and logistic services. Since 2013, the Washington-based lender has invested over US$1.3 billion in the country. Vikram Kumar, IFC’s country manager for Myanmar and Thailand, said the move is to “ensure the availability of safe, high-quality foods from the farm to fork, increasing the agribusiness sector’s export potential.” He added the loan will eventually benefit small businesses and service providers along the value chain. According to Jens Michel, CEO of the JV, the company operates a warehouse and distribution centre in Thilawa Special Economic Zone (“Thilawa SEZ”) for fast-moving consumer goods and food products and provides “doorstep deliveries” for customers. Logistics companies are seeing rising market demand from retailers and wholesalers just as infrastructure has been gradually developed. Mr. Tomoaki Yabe, managing director of Thilawa-based logistics company Daizen Myanmar Limited, stated, “with the expansion of the retail/ wholesale sector thanks to partial liberalisation, we are definitely seeing more market interest in the logistics.” Mr. Yabe added that “while infrastructure and transport remain challenging in many rural areas, warehouse facilities in Yangon and Thilawa in particular have modernised.” Some warehouses, including Metro Wholesale Myanmar, can now cater for food products and have cold chain systems in place. An improvement in the reliability of power supply in the Thilawa SEZ is also a boon to investment. The IFC investment comes at a time when Myanmar continues to open up its retail and wholesale market to foreign companies. Pursuant to regulations issued by Myanmar’s Ministry for Commerce, 100% foreign-owned firms are required to make initial investments of between US$3 – 5 million to operate a retail or wholesale business, respectively, in Myanmar. For joint ventures with foreign entities where the local investor has at an equity share of at least 20%, the initial investments necessary for retail and wholesale are US$700,000 and US$2 million. Japanese Mycare, Aeon and local City Mart established joint ventures in 2018. Lottemart and E-Mart, South Korea’s two biggest retailers are expressed interest in establishing operations in Myanmar. The Myanmar Investment Commission (“MIC”) has granted approval to the establishment of a South Korean – owned industrial estate in the Township, Yangon. The Myanmar Industrial Complex (“KMIC”) will be operated by Korean-owned Myanmar Industrial Complex Development Co. Limited and developed over 224 hectares. KMIC will be developed as a partnership between South Korea’s Land and Housing Cooperation and Myanmar’s Department of Urban Housing and Development under the Ministry of Construction. The project is expected to cost US$110 million, take five years to complete and create between 50,000 – 100,000 jobs. The complex will include facilities suitable for small, medium and large enterprises, employee housing, service providers, a training school and green areas. Malaysia’s KNM Group Bhd (“KNM”) has secured an engineering, procurement and construction contract worth US$24.87 million for a liquefied petroleum gas (“LPG”) facility in Myanmar. In a Bursa-Malaysia filing dated 1 March 2019, KNM disclosed its wholly-owned subsidiary KNM Process Systems Sdn Bhd had been awarded the complete executed lump-sum-turnkey contract (“Turnkey Contract”) today with CECA Gold Company Limited (“CECA Gold”). The contract relates to the engineering, procurement and construction of a liquefied petroleum gas receiving, tanking, storage and bottling facility in Kyaut Tan Township Thilawa, Myanmar. According to the Announcement, the lump sum turnkey contract pertains to the engineering, procurement and construction of a turnkey LPG receiving, tanking, storage and bottling facility and further to test, pre-commission, commission and start-up the said facility within the period of years 2020 to 2021. CECA Gold is a Myanmar conglomerate engaged in the production, trading and distribution of LPG and provides turnkey solutions in cooperation with Singapore’s Jofu Holdings Limited. According to KNM, the Turnkey Contract will contribute positively to KNM Group’s earnings for the financial years ending 31 December 2019 to 2021. Yoma Strategic Holdings Limited (“Yoma”) and the Kokubu Group Corporation (“Kokubu Group”) have entered into a joint venture with SF Holding Co., Limited (“SF Holdings”), a technology-led international logistics service provider based in China. Subject to the satisfaction of certain conditions, SF Holding will acquire a 25% stake in KOSPA Limited (“KOSPA”) for US$4 million. The invested capital will used to fund the expansion of KOSPA’s current fleet and its warehouse capacity. KOSPA provides warehousing and third-party logistics services in Myanmar including cold chain solutions, inventory management and transportation. The newly formed partnership will build on KOSPA’s capabilities as one of Myanmar’s Leading integrated Logistics service providers and aims to widen its service scope to other categories of logistics solutions express delivery and cross-border deliveries. KOSPA intends to leverage SF Holding’s technological expertise to strengthen its service offering. Pursuant to the transaction, Yoma Strategic will retain its 50% stake in KOSPA with SF Holding and Kokubu each holding 25%. KOSPA will become a subsidiary of Yoma Strategic pursuant to the execution of a new shareholders agreement. KOSPA will also explore the possibility of expanding its logistics business into the cross-border trade between Myanmar and its neighbouring countries, especially China. This comes against the backdrop of deepening China – Myanmar economic relations through the Belt and Road Initiative and the Y-Shaped China-Myanmar Economic Corridor. The trade volume Between Myanmar and China is estimated at approximately US $10 billion annually, accounting for approximately 30% of Myanmar’s total foreign trade. 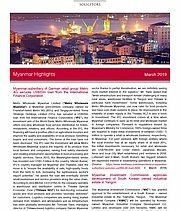 The volume and value of trade is expected to grow in the near future as economic ties between the two countries deepen with both the Myanmar and Chinese governments working to create economic cooperation zones’ along the Myanmar-China border. Besides the potential demand for inbound Chinese products arising from the growth in e-commerce in Myanmar, KOSPA has also identified several types of products that could be targeted for both import and export between the two countries. Examples include heavy cargo and freight shipping for import from China and agricultural produce for export to China. EME Myanmar Limited has led a six-digit US$ seed investment in Mote Poh, a Yangon-based employee-benefits-as-a-service startup. Vietnam-based venture capital firm Nest Tech also participated in the seed round. Mote Poh founder and CEO Loring Harkness said Mote Poh operates an employee loyalty programme in the form of a coupon-book of 100% free items and exclusive discounts at shops and restaurants and on activities across Myanmar that companies can use to reward their employees. According to Harkness “Mote Poh makes employee benefits easy – just great benefits employees love, with no hassle and no big price tag”. Mote Poh, was founded in May 2018, and is currently based out of a co-working space in Phandeeyar. It already services over 60 customers including Yoma Strategic Holdings and MyJobs.com.mm, is in the process of developing a mobile app and other types of loyalty programs. Mote Poh’s aim is to reduce the high rate of employee turnover characteristic of industries across Myanmar.